Pau Gasol slams home two against Cavs. On a night the Lakers made history, the world champs showed no sympathy for the woeful Cleveland Cavaliers, and humiliated them, 112-57 at Staples Center on Tuesday. In a season most Cleveland fans and players would like to forget, their loss to the Lakers had to have felt like rock bottom. The Lakers held the Cavaliers to their lowest point total ever at 57, and in the process sent them to their 11th straight loss, dropping their record to an NBA-worst 8-30. The Lakers’ win was their third biggest since moving to Los Angeles, and only the third time in their history they beat a team by at least 55 points. The last time was March 19, 1972, when they pounded the Golden St. Warriors 162-99 at the Forum. The 57 points were also the fewest the Lakers have allowed in the shot clock era. 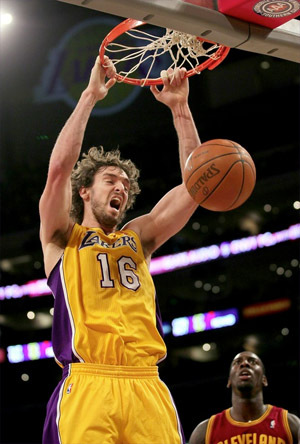 Los Angeles had seven players in double figures, led by Ron Artest who had 15 points and six assists. Andrew Bynum also had 15 points, to go along with six rebounds, and five blocked shots. Pau Gasol had 13 points and 14 rebounds, and Kobe Bryant, who took just three shots in the first half, scored 13, to go along with eight assists, and five rebounds. The game was never close, as the Lakers jumped out to a 27-12 lead after one, and it only got worse for Cleveland from there. They led 57-25 at the half with Bryant scoring just two points. The lead ballooned to 50 early in the third quarter, and to add insult into injury, Shannon Brown hit a half court shot at the buzzer to give the Lakers a 92-41 lead after three. The Laker reserves also didn’t let up defensively, and grew the lead in the fourth, outscoring the Cavaliers 20-16 in the period. The Cavs shot just 29.9% (23-77) from the floor for the game, and the Lakers’ bench nearly outscored Cleveland by themselves, with 46 points from the reserves. They also held the slumping Cavaliers to 1-14 (7.1%) from beyond the arc, and outrebounded them 53-42. For the game, the Lakers shot 53.5% (46-86) from the field, and 10-20 from the three-point line. They also only turned the ball over 12 times, compared to 19 for the visitors. Cleveland had just two players in double figures. Alonzo Gee had 12 points, and Ramon Sessions had 10. The Cavs starters had just 23 points combined, shooting 8-37 (21.6%) as a group. Samardo Samuels was 1-12 from the floor, as he was constantly hounded by the bigger Laker frontline. In fact at one point in the third quarter, Pau Gasol and Andrew Bynum had made as many baskets combined as the entire Cavs team had. The Lakers win was their fifth straight, as they continue to play solid basketball at the defensive end. They’re now allowing just under 96 points per game for the season after Tuesday night’s defensive clinic. The champs will play tomorrow night in Oakland against the Warriors, in the second game of a back-to-back. The Warriors have been blown out twice at Staples Center, once by 24, and the other game by 28. This will be the teams’ first meeting in the Bay Area this season. The Warriors have been playing better ball lately, they’ve won six of their last 10 games.